charts.html file for creating the Chart and Events. charts.css file for adding basic style to our Chart and Events. 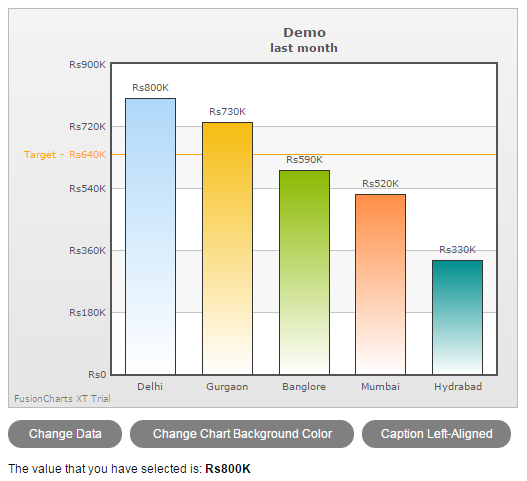 Now we create click events - for update the chart data,change the background color and change the caption alignment. And in the last we create value indicator - to show chart values on click chart. 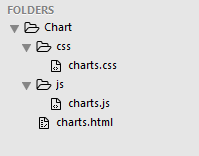 Next file to talk about is a css file that we have added to give our links and chart a fine look. This is a simple CSS file without any angular or fancy stuff in it. Then we set the datasource using the regular FusionCharts JSON format like chart theme,caption,numberPrefix,data values and trendlines(target line). background color of chart and changeCaptionTextAlignment function to change caption alignment. And the last function events to show chart values. This is how the HTML code above will be displayed in a browser with Chart and events. You can see the working demo of the above chart and events here.